Poured into my Boulevard Brewing Smokestack Series tulip glass. This poured a nice, clear bronze color similar to that of Bourbon. This might as well be. I can definitely see myself pouring shots of this beer and giving them to the beer uneducated, and they will totally believe that they just took a shot of Bourbon. Wish I could find another bottle of this, so I can put that to the test, but with the rarity of this beer, I really don’t think I would play around with it! Sorry! There was a thin off white colored head that quickly vanished, but I have noticed that a lot with strong beers. As with most strong ales, the presence of alcohol in the aroma is there, this time mixed with hints of raisins, caramel, and malt. This one is definitely showing off the malts in the smell. Again, I think I could fool some of my Bourbon/Whiskey drinkin’ Metal Head friends with this one. Now to the taste of this beast. This beer is very sweet, and has a strong sugar flavor. It even leaves the sugary sweetness on your lips after a drink, well for me, on my mustache. No wonder bees and mosquitoes like me so much. If I drank this outside in the middle of a Texas summer, I know for a damn fact that I would be attacked even worse than ever. Flavor hints in this one are caramel, brown sugar, cherry, anise, maple syrup, raisins, and alcohol. This is almost liquor like. The body is medium-thick, sticky, and has that bourbon burn on the way down. Thirsty yet? You should be! Do yourself a favor and visit your local craft beer market and see if this bottle is available. Buy it, age it for months, years, decades, whatever, just get it! 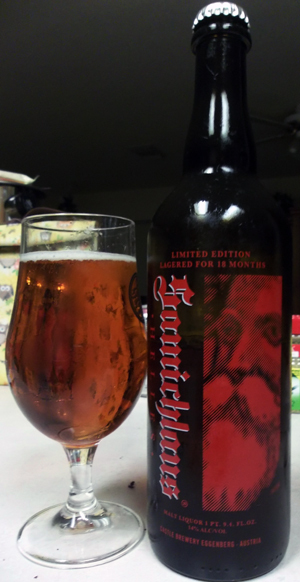 One website I read said this version is no longer being made, but I couldn’t find anything if that meant no more for that “batch” or if that meant that this brewery will never do the limited edition 18 month aging. We shall see. I purchased 2 bottles of this limited ed from Invino.com They usually have it for sale in October in a special beer pop up tab. My bottles are sitting in a dark cool place. Will probably open one this coming winter. Looking forward to it. Cheers, and thanks for the review. Awesome! Yes, I need to find this bottle again, and age it. I really did open this one up too soon. Cheers!